Patrick grew up in Bay City, Michigan where he began playing the guitar and trumpet at age 6. Sticking with the guitar, he began to play clubs at the ripe age of 14. He toured with a fusion jazz group "Clockwork" in the late 70's before returning to school to study music. He moved back to San Diego in the early 80s, where he immediately hooked up with Devotion, a popular Earth, Wind & Fire type band with a five piece horn section. He later did studio work with the well known production company Jam Power, and co-wrote and played with The Chill, an R&B outfit signed to Orpheus/Capitol Records. 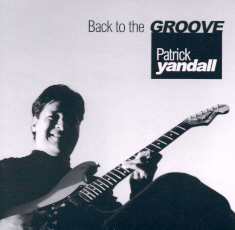 Patrick started recording his new album "Back to the Groove" in January 2001, mixing and mastering were finished in October 2001, finally it will be released in March 2002. Patrick showcases on his new album his creativity and mastership in many instruments. The midtempo starter Mr. Mikio is therefore a represantative model. Patrick plays all instruments except the bass. He reveals with his distortion guitar play his funk-rock roots . "His guitar playing can be compared to Larry Carlton but with the rock edge of Steve Lukather" (CDBaby). His smooth side is to be listened on the next tune Your Move. His guitar gets a silky shimmer especially with the warm whispering background vocals of Rachel Evans, Roosevelt Carter, Cicily Johnson, Devenny Allison and Keni Yarborough. The sound of his Ibanez guitar reminds at George Benson's music and the similiarity is obviously intended. At the end of the tune Hollis Gentry III adds a sax-solo, which finishes to soon. Yukiye is also very radio-like especially with Carl Evans' ingrating flute synth and Hollis Gentry III 's honey-smooth sax play. You' re the Only Woman is a further example for Patrick's Bensonish guitar play. The vocoderized chorus rounds off the intelligent arrangement. Slow Change is Patrick's return to the rocky Fender guitar featuring Keni Yarborough's vocals. In addition Patrick also plays his guitar with wah-wah effects. Patrick loves the diversity. That makes his album vivid. Back to smooth with the romantic The Joy of You. Fans of the acoustic guitar and the romantic mood will like this excursion. On the title tune Back to the groove Patrick uses the smooth Ibanez and adds an edgy Fender solo. The tune has a hooking refrain and my acoustical memory constantly reminds me that I have already heard this refrain. Is it possible that Patrick was inspired by Roy Ayers' You've Got The Power (Ichiban Records 1989)? Crying in the Dark could also be on an album of the Scorpions. Patrick plays a melodious rock tune and his guitar can cry. On the Cool Side is a further reminisence to his rocky past. Dr. Smoothe is an uptempo Smooth Jazz piece with a propulsing groove. On the substructure of some rhythm loops Duncan Moore realizes a perfect rhythm frame for Patrick's hot jamming. The tune is very contemporary in the style of Down To The Bone. For the Soul slows down the tempo to a contemplative instrumental with some blues feeling. Got to Love features Roosevelt Carter's great voice. This piece has attitude and is well placed in the tradition of R&B. Wonderfull arrangement and impressing vocals. Undoubtedly Patrick has succeeded to play in an outstanding album with a limited budget.